It wouldn't feel like the holidays without a gathering with the gals! When I'm trying to host a soiree, I try to focus on fun decor to make up for my lack of cooking skills. You may be the opposite, so just stick to your forte and get some ladies together for your own shindig. I thought a simple happy hour gift exchange would be a great way to celebrate the holidays (without stressing out with meal prep)! Here are some tips to recreate a fun & festive Christmas celebration of your own. I'm a huge fan of a chic bar cart, but you don't need to own one to have a swanky cocktail set-up. 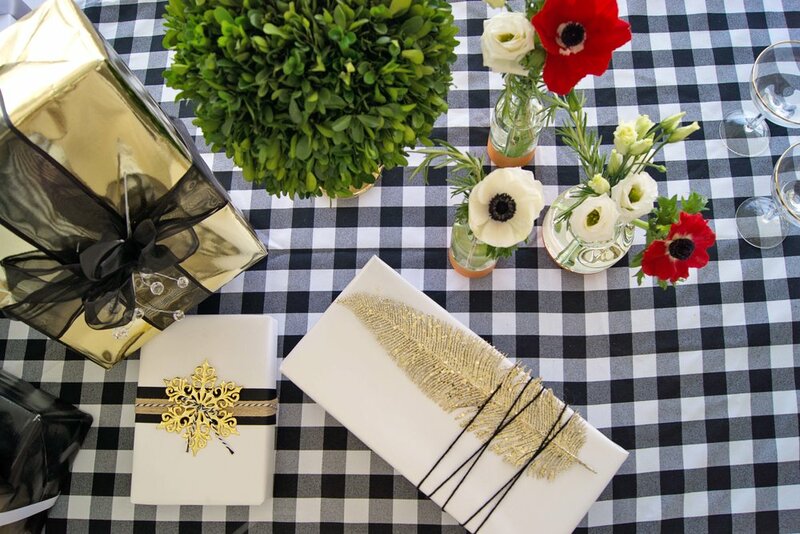 You will see me reusing my gingham table cloth by TableVogue again and again, because it totally transforms a basic card table (yes, that's a $30 table underneath!). 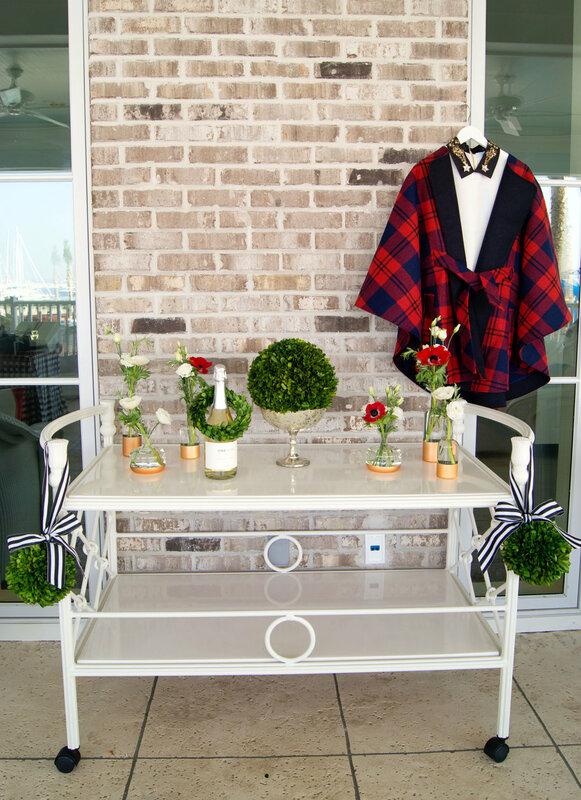 Any piece of furniture (like this white console-like table) can also be transformed into a bar area or place for guests to put their purses/coats with a few flowers and greenery. 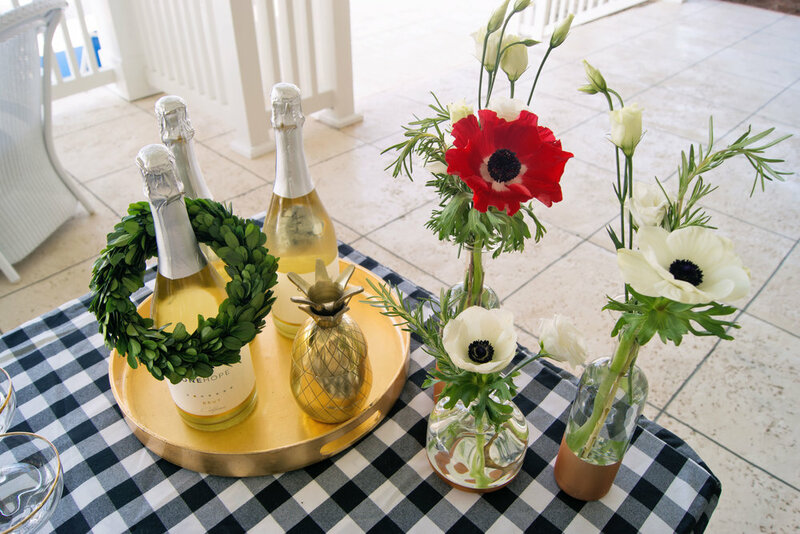 Frampton's Florist used gold-dipped vases, boxwoods in various sizes, and minimal blooms like anemones to help give us a festive tabletop. When it comes to libations, nothing says "celebration" like champagne! The One Hope brut that I served is a definite crowd pleaser, and it tastes even better because it's a brand that gives back. 50% of profits go to various charities, and another $25 will go to St. Jude (for cases purchased through 12/9). You also will get 30% off of a case, so this bubbly won't break the bank! Purchase here. Depending on where you live and what the weather is like, this could mean meeting up in a park or on a friend's rooftop. Even simply gathering your friends in a room of the house you wouldn't otherwise use, like a formal dining room, can make the occasion feel special. The Beach Club at Charleston Harbor Resort & Marina was gracious enough to host us, and we really enjoyed their very southern porches, fire pit, & giant chess set! You are going to love it at this newly opened hotel, and I'm sure they will have many fun events of their own coming soon. We had so much fun during this happy hour gift exchange, and don't forget that "wrapping it nice shows you care twice"! Luckily we had some help with the wrapping thanks to The Blue Root, who is offering Christmas gift wrapping services & curated gift boxes with free delivery. Check out the details of our holiday Draper James attire HERE, & I'll be sharing some gift guides soon if you could use a little help filling those Christmas stockings!